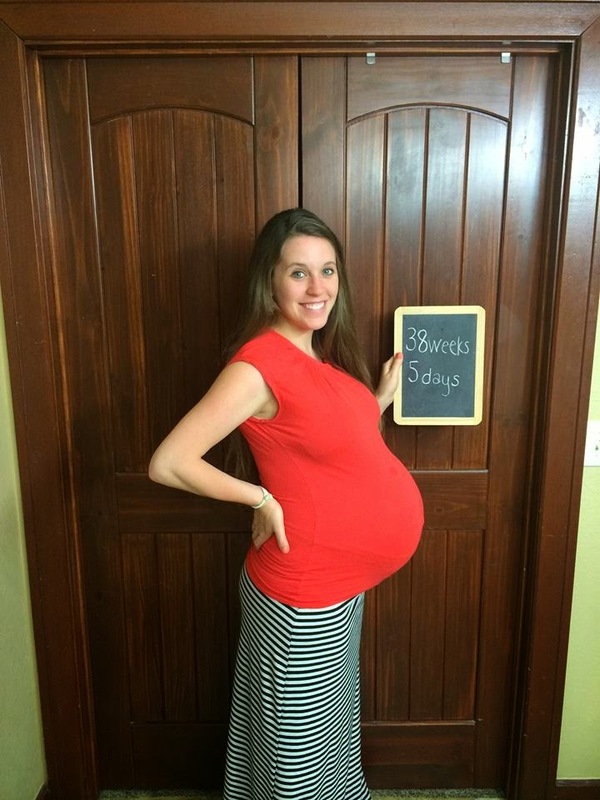 Duggar Family Blog: Duggar Updates | Duggar Pictures | Jim Bob and Michelle | Counting On | 19 Kids: Baby Dilly...Coming Very Soon! God bless you jill.Hope you have a safe delivery. Sooooo... excited for them! Beautiful! How exciting!! Jill it is almost time to deliver your baby. Can't wait to see your little one. praying you have a smooth delivery. Congratulations to both you and Derick! So excited for you!!! Jill and Derick,not too far now:O)) Praying for a wonderful/easy labor and delivery and birth experience for both Daddy,Mommy and sweet precious Baby Dilly!!!!!!!!! Can't wait to hear the Awesome NEWS..." Baby Dilly has arrived"!!!! Jill knows a lot about pregnancy so why would she travel out of state at 38 WEEKS? Traveling in the last month of pregnancy for sure is not recommended by doctors. She is very fortunate her water didn't break and that her little one didn't come early. HAVE A SAFE DELIVERY!!! Hey have you ever thought of the name SKYLAR?!?!?!!!!!!! Wow! There is a big baby in there, I think Jill's siblings at home school must be scratching their heads about this problem (actually I think I am too). I'm from Russia, I love your family, you are super! Very blessed. I've had six pregnancy but three losses this side heaven. Yay! So excited!! :) Jill looks so cute! ;) May God bless you both in this new season of your lives!!! Congratulations to the both of you! I hope you have a easy, fast, and safe delivery. God Bless you as new parents!! Praying all goes well. She looks really good. I think she will get right back in shape. Looks to be all baby right out front. Beautiful. Bet they will name their first son Richard James or James Richard..to combine both of the Grandfathers names into their first Son's name. I am guessing that Baby Dilly will arrive the first day of Spring!!! The 20th!! So happy for them, excited to see that the wait to see their precious boy is almost over! Can't wait to hear a name! Derick and Jill, May God richly bless you both as you anticipate the birth of your new little bundle of joy! God's greatest gift to a couple! We have always said, our children ARE our most prized possessions on this earth! Enjoy this meaningful time in your lives. We can't wait to meet "Baby Dilly". God Bless! Wow! That is one BIG baby bump! Jill is just glowing and every time I watch the show I can not think of a better family to be part of. Derek is going to be a great dad. Good luck Baby Dilly, you are in for a blessed adventure. Her due date is one day after my birth day. What happened to modesty? This shirt is soooo tight. It would be something if the baby was born during the day on March 21! I think it would be very cool if your baby boy was born on the day Derick proposed to you, Jill ! What a lovely proposal that was! May God bless you 3 & I pray the delivery goes smoothly. It'll be fun to see the little guy. I am sure you & Derick & everyone in your families are excited to meet this fortunate boy. You two will be wonderful parents & he'll have lots of great role models in grandparents, aunts,uncles. She looks so ready to give birth. Praying for a smooth labor and delivery! God bless you, Mr. & Mrs. Dillard and Baby Dilly! I am praying it will be an easy and speedy delivery for you. God bless you both. Can't Jill find something new to stand in front of when she gets her picture taken?? I'm so excited, and I'm sure the Dillards and Duggars are thrilled!! Praying for a healthy, "easy" delivery. The baby could come at any time now! I predict that he is going to be born on the 20th. And if you are comfortable with it... I would really like to see the delivery! I know TLC does a good job with Anna by doing it in a tasteful way! I had to say this because I've seen a couple of comments saying they don't want to see your delivery(then don't watch it) and I just want to let you know there's plenty of people who do want to see it... As long as you are ok with it. Blessings from California!!!! I have been thinking about you every day this week Jill and Derick as you start counting down the days until Baby Dilly makes his debut! It's always exciting, the miracle of labor and delivery of your first child. Praying now for peace over Jill, Derick, and everyone involved in this delivery! Can't wait to see Baby Dilly!! Please keep us up to date! Love your family, Jill! You are certainly ready to having this baby ! Can you pass along my thanks to Jill and Derrick for sharing their journey with us, I know it has its ups and downs when sharing something so precious and private as their first pregnancy with the world on the internet, may God continue to bless you both and little Dilly, congratulations! God bless. CONGRATULATIONS!!! Pray for safe delivery. Hope he comes soon, many are waiting for his arrival. I can not wait! I hope the baby is healthy and the parents are happy. Congrats to the future mom and dad! Are they naming baby dilly when he is born or have they already found a name? Praying for you Jill! You are beautiful, especially with this large extra weight you are carrying around! :) I have heard from friends what it is like just before the due date and I must say that I am impressed that you went on that vacation! I'm sure you're just waiting for the baby to come out! Hopefully he won't be overdue for you... I was the first baby for my Mum and I was 2 weeks late and boy was she ever ready for me to come out! To Daddy Derick too, Congratulations and you are also in my prayers! find much more flattering clothes if she tried. Praying for a safe and easy delivery. Can't wait to see God's gift to such a sweet couple. Have they picked out a name yet? Her pregnant belly goes straight out like mine does! I can tell that she is totally going to lose the baby weight so fast. That will be great! Healthy baby and healthy mama is what we want. May you be blessed with an fast delivery and a healthy son. Hey, now is good time for a poll :-) I say the baby will be 9lbs. 3oz.and 23 inch. My mom says 9lbs. 9oz. 22 inch. Best wished to Jill & Derrick as they prepare for the arrival of their new little one! Congratulations to you guys! Prayers for a safe delivery!! Jill, Please please, consider getting an Epidural Painkiller for oyour labor, as Whitney Bates did. No reason, religious or otherwise, to suffer pain needlessly. The Epidural makes childbirth so much CALMER, pleasant, and spiritual, as you can really enjoy this unbelievable miracle of birth! Many hospitals have more natural options, including birthing tubs and Doulahs, that allow you Epidurals. Just my opinion: I hope someone in the family clan will have lots of children and name baby one with an "A" name (like Aaron), and baby two a "B" as in Blake, and baby three a "C" as in Charlotte, etc. and see how far they get through the alphabet. Let's see, Michelle would have made it to "T" had she tried this. Just a fun thought. She's nine months pregnant!! of course her shirts are gonna fit a little snug... She's looking wonderful:) Congratulations, Jill and Derick! Congratulations on your baby! Jill looks so beautiful and I know both Jill and Derick will make great parents. I can't wait until we get to hear more once Baby Dilly is born. I have been thinking about you guys every day and I will continue praying that your delivery goes well. God bless you! My first baby was 21 days past the due date.